Smokesignals Sighted after 40 Years ! 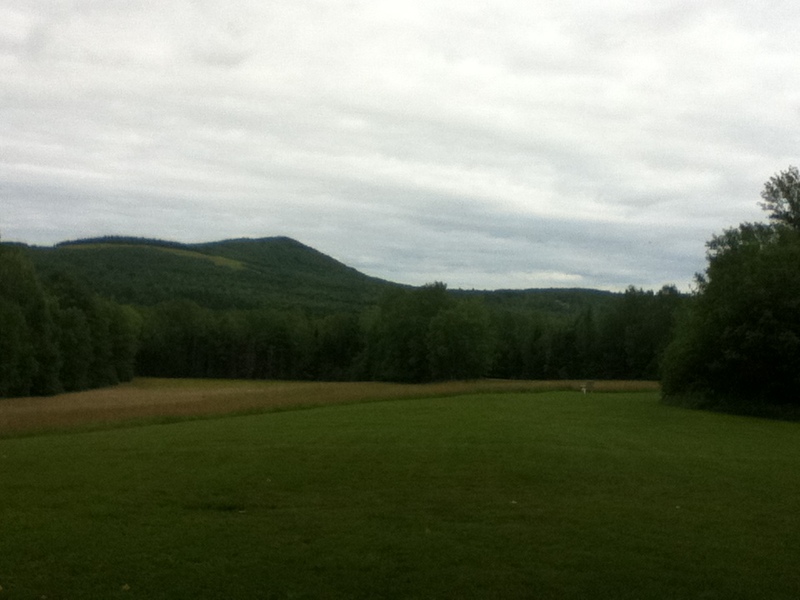 Cave Hill Road in North Leverett, MA was the gathering point last night for the 40th anniversary gathering of the UMass/Amherst 1967-72 Outing Club. This was a group of which three of the members- Albert Howcroft ( “Craft”), Dave Palmer ( “Pommer”), and Terry (“T.C.”) Cassidy served as my mentors, chauffeurs, and guiding lights during my stay at the campus. 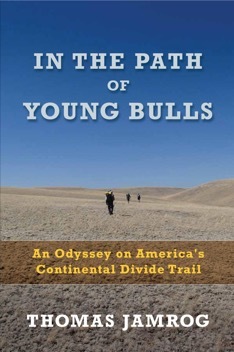 From them I learned about spelunking, rappelling, backpacking, canoeing, winter backpacking, and how to live cheaply enough so that I had enough spare cash to pay the $.01 a mile driving cost that allowed me to be spirited around the northeast countryside having unanticipated adventures in the outdoors. It was a life that I immediately latched on to. A life that made immediate sense to me. On the weekends, I eventually became comfortable sleeping on the ground, eating either peanut butter and jelly or bologna and cheese ( American style) on white bread sandwiches for lunch, and eating supper out of glop pots containing mac and cheese or some other thick hot mess. These people were so damn funny that most trips took on the spirit of nonstop stand-up comedy routines with a never ending stage show. Of course , I can also remember being intensely miserable, often for hours at a time- either from the big hurt of nonstop climbing in the Whites, or from hypothermia during long trips in subzero temps in unheated VW buses. So I braved up and walked in to encounter over 30 folks, the VAST majority who I did not recognize- at all! It was likely the same for them when they looked at me. But I could easily find those big three icons, still the same spirit of adventure, and great big hearts simmering underneath their forms. 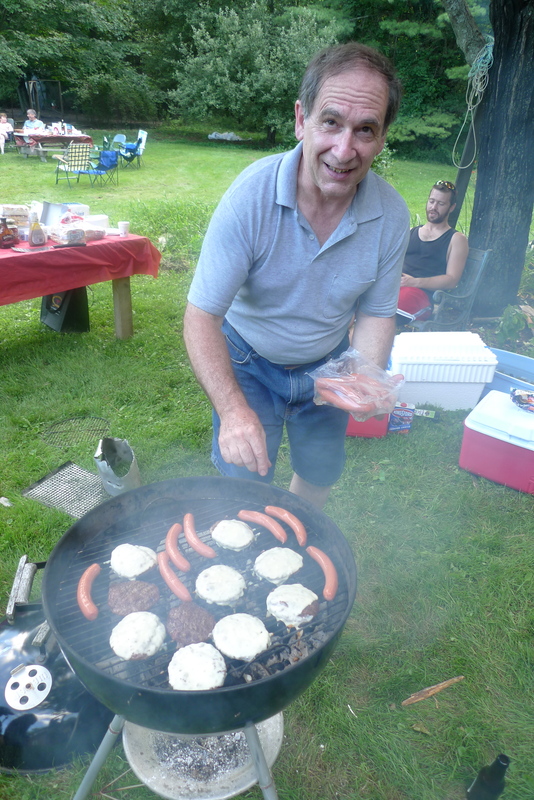 We ate from rickety old BBQ grills stuffed what appeared to be home-made charcoal, with the usual burger, dogs, and chicken for the gang. There was an entertainment hour, with old Four Seasons songs, morphed Beach Boys tunes, a stint of bluegrass fiddling, readings from ancient notebooks, and old “SmokeSignals” newsletters. Here’s a video clip of the fabled trio leading the outdoor audience in a rousing chorus of Thunder Road. I wrapped up the night’s program with my PCT presentation, aided by the General, who came along for the ride. We slept in freshly-cut hayfield under quiet , star-covered sky on a night when the air was clear and cool. In the morning Palmer made us blueberry pancakes with syrup from his own maple trees. Tonight I plan to study a couple of photos of two pages taken from a Fall 1968 “SmokeSignals” newsletter, a journal that I edited. It’s Craft’s meticulously researched nonfiction piece “The UMass Scroungers Guide”. On the road after really fine visit in North Leverett with members of the UMass Outing Club. Kraft, Palmer, Terry C. are the original hiker trash. Still practicing the dirt bag lifestyle after all these years. 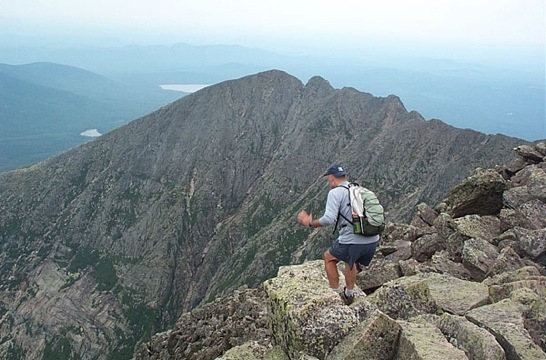 Off to Katahdin tomorrow. Knife Edge, baby ! 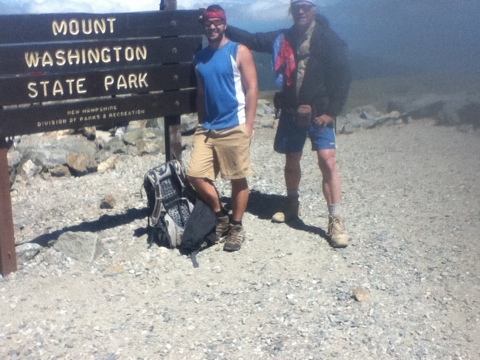 Lee and I secured a parking spot this coming Tuesday for what should be my 15th hike to the summit, then the Knife Edge. More later. 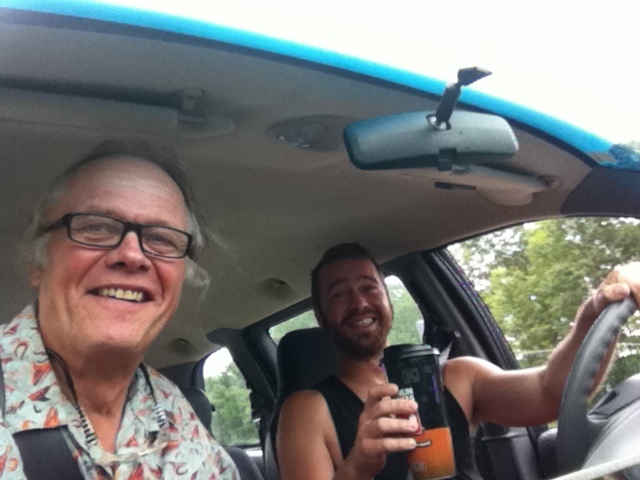 Lots of coffee, headed to UMass/ Amherst Outing Club. Big energy. “Caution: This is the most difficult regular hiking trail in the White Mountains”, reads the White Mountain Guide. 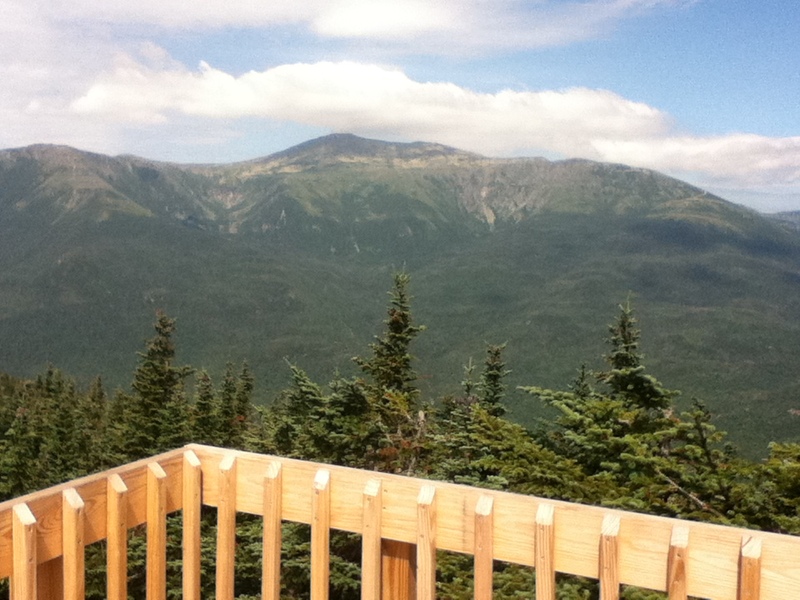 With an elevation gain of 4,256 feet in 4.4 miles of trail from Pinkham Notch visitor’s center to the summit of Mt. Washington (6,288′), the description appears right on. 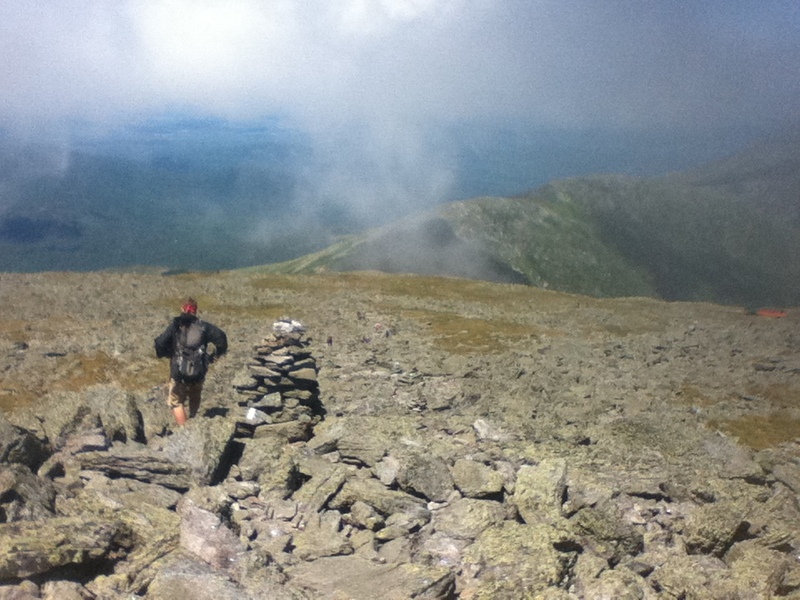 Here’s a shot of Huntington Ravine, on the right, with Tuckerman’s to the left. The picture was taken from the top of Wildcat Mountain, which we climbed yesterday. Yup, it’s steep, – real steep! The trail gets increasingly steep, starting as a normal trail, then enters a steep slope of broken rocks known as The Fan, where at one point it climbs 650 feet in just 0.3 of a mile, rendering it way beyond the usual steep Whites climbs. It is at this point that the trail reaches the head wall and you are faced with an expanse of smooth steeply sloping ledge that is completed by jamming your feet into and clawing your way 30′ up a vertical crack, then skittering sideways to enter a less treacherous, but very exposed route up to the lip of the ravine. Here’s a shot of that exact point, with two other climbers in and above “The Crack” to illustrate! I found myself pulling my body up some tough sections, and was surprised how much upper body strength the trail demanded. General Lee and I made it to the summit of Washinton at 11:10 AM, some 3 hours and 40 minutes after starting the hike, a time that was 1 hour under the formula established by the AMC. Once on top we gave up waiting in the long line of people waiting to get their photo taken by the summit sign, 95% of them riding their car, motorcycle, ATV, or the train to get there. We spotted a fellow walking by as we were eating our lunches while sitting in two chairs near the summit building. After our eyes locked, he came over and asked if we were thru hiking, which he was doing- Northbound. We gave him one of our steak sandwiches and another day hiker sitting next to us gave him a huge bag of most excellent gorp. then Lee and I went to the hiker station on the ground floor and talked and hung with the hikers as we brewed up some fresh coffee from Lee’s Jetboil. Then we had to walk back to the car. Since descending the way we came up is considered a suicidal possibility, we decided on a more roundabout route. Or routes. 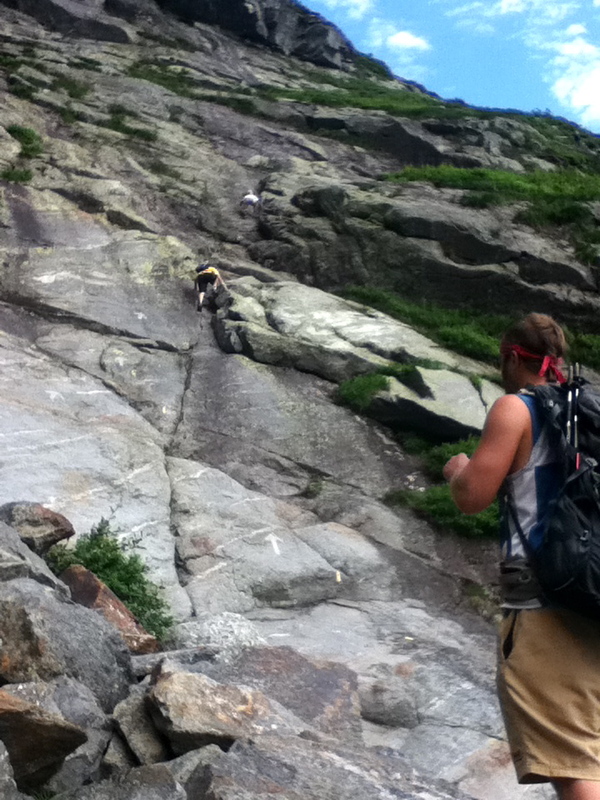 , then ascended off the AT to the top of Mt. Jefferson (5716′). Unfortunately he swung back down the Six Husbands Trail to link back up with me, who was having my own challenges descending the steepness of the Great Gulf Trail. Lee said that his descent was even more treacherous than the Huntington Ravine trail would have been, even with the use of several ladders. Emeralds and crystals were the images that came to me as I wound my way northeast along the west branch of the Peabody River until I reached what I thought was the AT near the Osgood cut- off. I walked for over a half hour until I couldn’t shake the nagging feeling that I was not on the AT. Why? No white blazes. Not one. The footpath certainly looked beat down enough to be the AT but where were the blazes? I had the sun low in the sky on my right, it was past 4PM, so I was oriented in the correct direction- south. And I was climbing again. So I turned around, finally convinced I was not on the AT. After about a half hour of fast hiking, I eventually ran into General Lee who was coming up my way, either making the same mistake, or we were both really on the AT. He looked at my map and proclaimed that although he also had the gut feeling it was not correct, that it did look right to him, despite no white blazes. Lee is very good with maps, and counted contour lines to determine that we had to go up 550′ to 2850 in elevation before we would start the final descent. I was fact checking with the altimeter on my Highgear watch. We went back the way I just came from, now my third time over the same mile of trail. Eventually we reached Low’s Bald Spot and soon the white blazes started up again, but now there were blue blazes right next to them, which appeared odd to me. 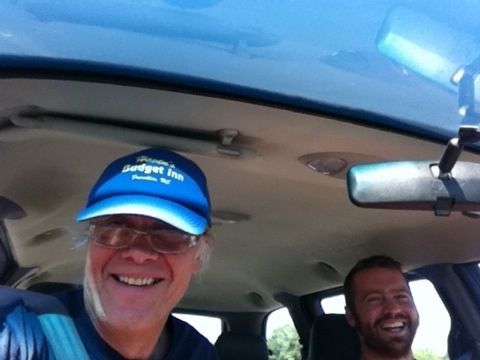 By this time, it was close to 6 PM and Lee and I were on unsteady feet as we reached the car in the nearly empty lot. It topped out as a 15 mike day for me, including the toughest trail in the Whites, right after a day up those Wildcats. I’m taking a zero day tomorrow. Now does anyone know why there were no white blazes on that 1.9 mile section of the AT? I really want to know. 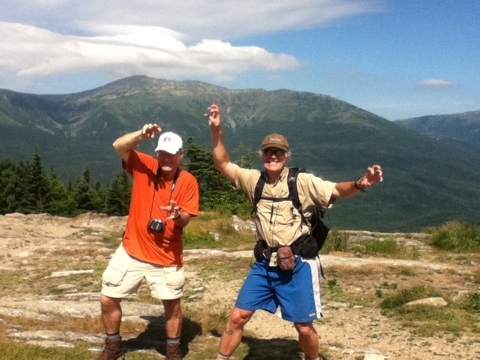 Started hiking up the Wildcat trail out of Pinkham Notch in New Hampshire’s Whites at 8 this morning. We finished 9 miles later just before 3 PM. Exhausted, but a good exhausted. It was as humid as you can stand. It was a hike characterized by an initial mile of paralleling Rt 16 followed by 2,000 vertical feet of climbing trail within 2 miles . Clarkie, my brother Roy, General Lee, and I held strong up the first half of the climb, pulling over 1,000 vertical feet on top of that first mile by 9 AM. Within another hour we were roaming around the top of the gondola lift to the summit of 4,422′ Wildcat A. An armada of cameras captured the moment. Yesterday it got within 3 degrees of 100 out in Conway. Today was much better, and the higher we hiked, the cooler it got. Breezes were present off and on. All in all, it seems to be a good decision to hike here in the midst if this heat wave. We lumped up and over all 5 high points in the Wildcats, then dropped over 1,000 feet to reach the Nineteen Mile Brook trail. Falling waters were cool and clear, and we stopped near a couple of pools to soak our feet on the way back to Clarkie’s auto. 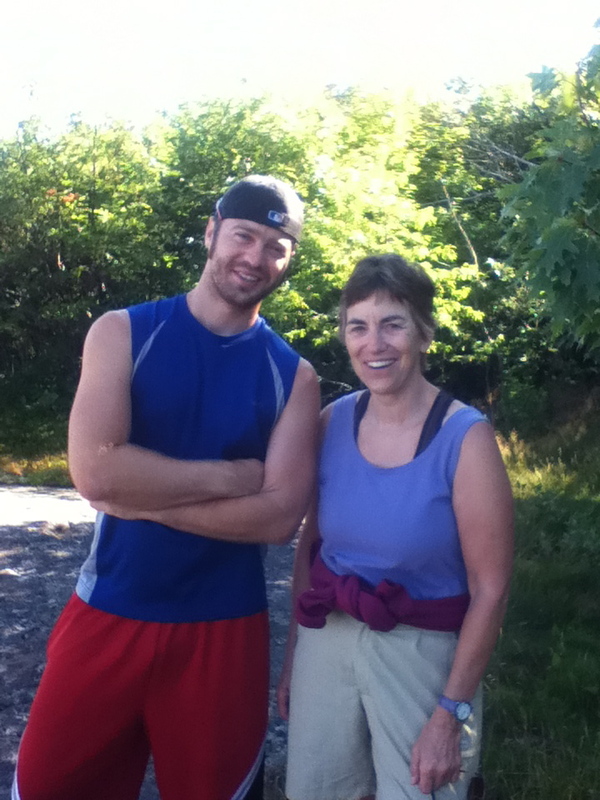 I’m ramping training for an August thru-hike of Vermont’s 270 mile Long Trail. Thursday night I joined 11 of The Bubbas in mountain biking the new single track trails laid down in Camden’s Ragged Mountain/ Snow Bowl. I was most impressed with the work that has been done there in the past year and a half. The biggest challenge for me was recovering from riding and pushing my bike up the slopes near the top of the almost 1300’ summit. From there on, I was mostly able to keep up with the pack. The highlight of the night was finishing the last steep downhill section, which I cleared from above World Cup to the parking lot. It was two hours of intense work, for sure. Yesterday morning, General Lee and I spent 4 hours hiking the Bald-Ragged section of the Georges Highland Path. We parked the car at the Barnestown access lot, then went up and back to the summit of Bald Mountain, where we could see the Bigelow Range in the distance. We also stopped to chat with the president of The Friends of Baxter Park, Barbara Bentley. Any Maine hiker needs to join this club. Barbara has deep ties to the park. She told me that her family has been spending a week at the Park for the past 50 years. 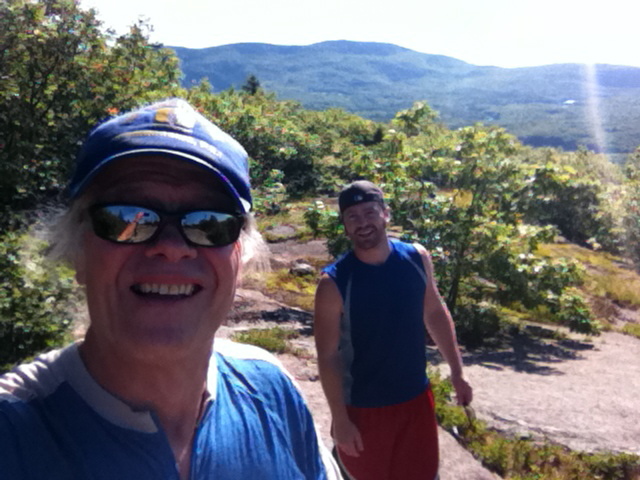 Then we drank some water at the car, packed up coffee and a percolator and headed up across the street past Buzzard’s Ledge to the top of Ragged Mountain. 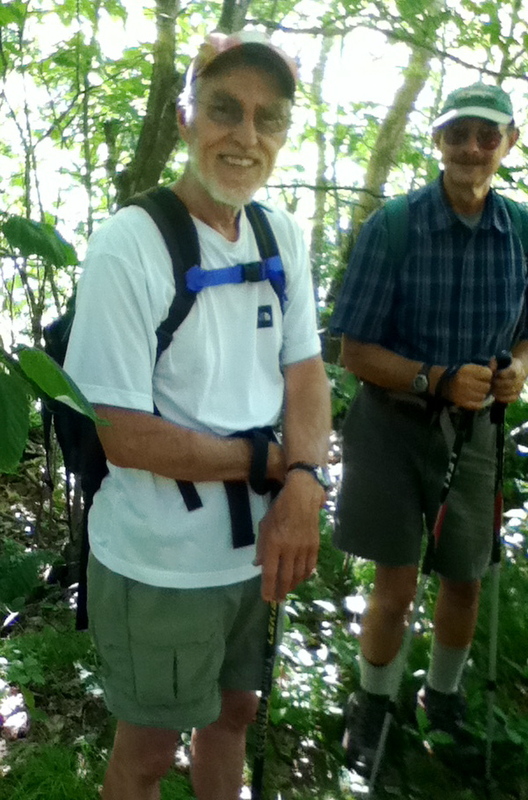 Up on the ridge, we encountered another AT thru-hiker, Marvin Higgins. 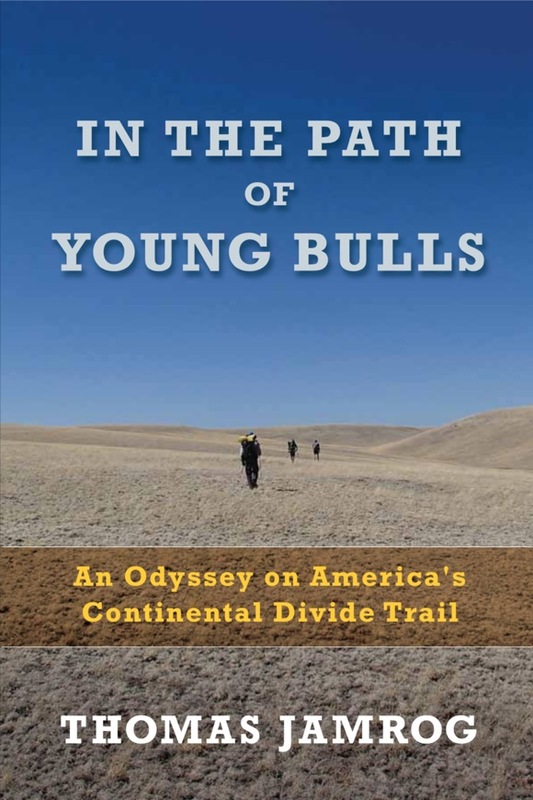 Marvin also has the distinction of being the 4th person to complete the International Appalachian Trail, back in the mid- 1990’s. The IAT extends northeast from the northern terminus of the Appalachian Trail at Katahdin, Maine to Mars Hill, Maine, before following the U.S.-Canada border north to Fort Fairfield, Maine, where it crosses the border into Perth-Andover, New Brunswick. It continues up the Tobique River valley to Mount Carleton before crossing the Miramichi Highlands to the Restigouche River valley in Quebec and along the Chic-Choc Mountains of the Gaspé Peninsula, ending at the peninsula’s easternmost point, Cap Gaspé in Forillon National Park. 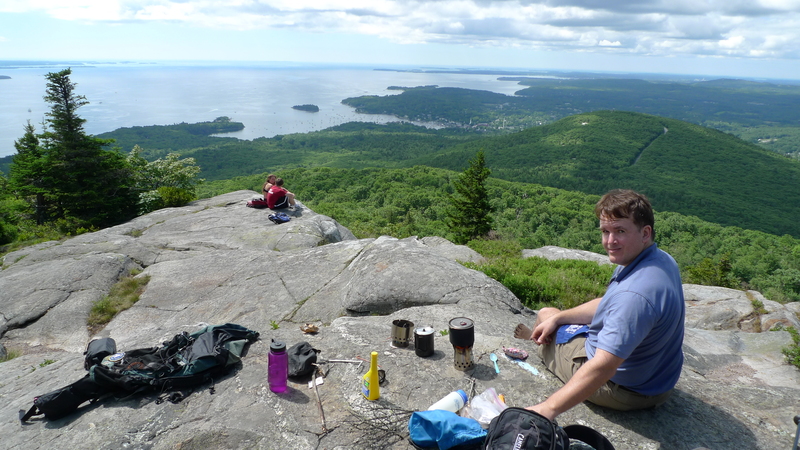 We stopped to have coffee and some snacks on the ledges at the summit, and enjoyed the views out to Penobscot Bay and inland to the western Maine mountains. The we bushwhacked a bit, found the trail and descended the ski slopes to the parking lot at the Snow Bowl. To finish, we went up Barnestown road, where we reached the car after 16 minutes of nonstop uphill walking over the hot pavement. I’m thinking we did around 9 miles this morning. Anyone out there have exact mileages for this circuit? Rockland Library PCT presentation report. What are the chances of two Triple Crown holders converging in Rockland, ME the same night? My presentation Thurs night was kicked off that afternoon by a chance meeting at the lunch counter at Moody’s diner. I greeted two fellows that I over heard two seats down from me who were talking about backpacking out west. They told me that they recognized me and that they were, in fact, coming to my talk. One turned out to be Disco Dan , who is a Triple Crowner, meaning that he had thru hiked not only the AT, but the PCT, and also the Continental Divide Trail. Later that night another Triple Crowner, True, attended the talk. Her considerable outdoor accomplishments are best reviewed by visiting her web site . Another surprise that walked in the door was from Brad Purdy, who graced the audience with a couple of platters of his famous Brad Bars, a high energy, gloriously tasteful concoction that has fueled backpackers since 1985. He also has mastered a dehydrated dinner- “Curry In A Hurry” that I received on both the AT and the PCT. Forty-seven people showed up, great questions, good times. Down to MA for another presentation on Monday night- July 11th. Yesterday I cranked out an unexpected 8 mile hike right from the door of my house. I was in bad need of a walking fix after logging in 20 hours of paid work in the last three days, which although might not be much for some of you, was a push for me. I thought I’d be out for an hour or so, but once I turned up toward Searsmont at the corner by Levensellar Pond, I caught a good stride of 4 mph or so and just kept on going. I shot 3 miles north on Route 173, hung a left on the 1.5 mile Lawry Road, where I discovered this (tiny) chair at the edge of a field then came 3 miles back on the Muzzey Ridge Road, straight up and over some high blueberry fields, down an abandoned woods road, through an overgrown, tired hay field and back to the house on High St. The drawback was that I didn’t bring water with me, and was naggingly concerned that I’d bonk in the humidity and heat, but after 2 hours and 20 minute of steady fast walking I was none the worse for the wear when I rolled home. I was hobbled up pretty good when I woke up this morning, but couldn’t resist walking again when my friend Craig proposed that we fit in a two and a half-hour hike before lunch. We met at the parking spot on Route 52 at the start of the Carriage Trail and wound our way up the blue-blazed trail to Ocean Lookout up over 1100′, almost to the top of Mt. Megunticook. We had a boil up and ate some of Craig’s home-made jerky on top. 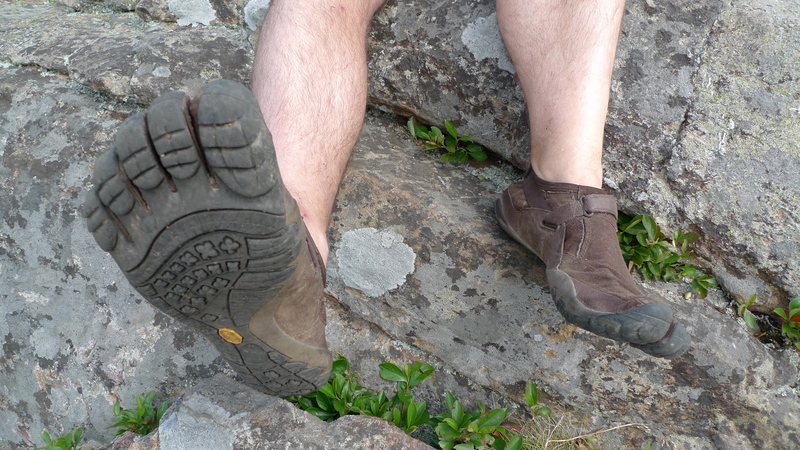 Craig was wearing his Vibram 5 Fingers KSO and had no problem making time over the rocks, roots, and mud on the trail. However, I was unable to shake the idea that I was walking behind a hobbit, trailing Craig on the way down. We had to hurry. Craig had to be back at the YMCA at noon to pick up his kids. He made it. I like hiking with Craig. We both love building fires, boiling up hot drinks, eating jerky or home-made energy bars, and jabbering about “Paleo- Primal” stuff. Craig keeps me supplied with good reading. I came home with Mark Sisson’s “The Primal Blueprint” and another 4.6 miles of pleasurable walking today.